Water (aqua in Latin, which gives us the word aquatic, and hydros in Greek, which gives us the words hydraulic and hydrology) is an element present in liquid form under standard conditions (ambient temperature and pressure), composed in its pure form of molecules that associate two hydrogen atoms with one oxygen atom in the form of H2O. Water, in its liquid form, is essential for living organisms, both for its mechanical characteristics and its chemical properties. 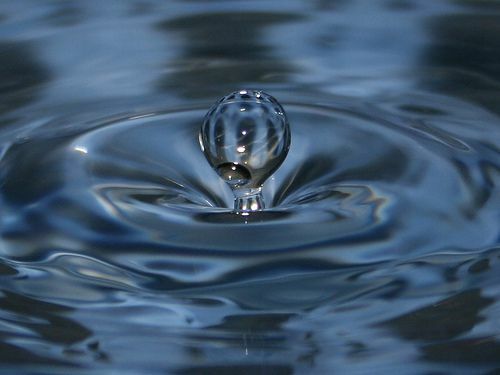 Consequently, living beings may be composed of up to 97% water. From a mechanical point of view the pressure exerted by water, called hydrostatic pressure, is used by organisms for mechanical support, whether in water (jellyfish...) or on land (plants). From a chemical point of view water dissolves the majority of solid bodies and thus facilitates chemical reactions, and therefore the metabolism. Water is in fact an essential solvent, sometimes called the " universal solvent ". In addition, the permanent presence of liquid water is what defines a circumstellar habitable zone, in which it is possible to discover extraterrestrial life forms comparable to life forms we already know. Note that the volume weight of ice (solid form) is lower than the volume weight of water, unlike many other bodies. This is why icebergs float.